The 220-page volume documented, in the words of Ridgefield Press publisher Karl S. Nash, “the struggles of the small band of parishioners against unbelievable financial difficulties,” and the two and a half centuries of “devotion and hard work” that followed. It remains the most detailed and extensive history of any Ridgefield church, and one of the best church histories in the area. Robert S. Haight Sr. was born in 1914 in Brooklyn, N.Y. He graduated from New York University and served in Europe in the U.S. Army during World War II. Haight spent 42 years with the Metropolitan Life Insurance Company, retiring as a marketing executive at the New York City headquarters in 1976. He and his family came to Ridgefield in 1955, living on Memory Lane. He began working on the church's history in the early 1970s, examining records and interviewing dozens of people. Dirk Bollenback, the longtime Ridgefield High School history department chairman, called the book a “scholarly, well-documented, and thorough account of our first 250 years.” Bollenback wrote a sequel covering the congregation’s history from 1975 to 2000. 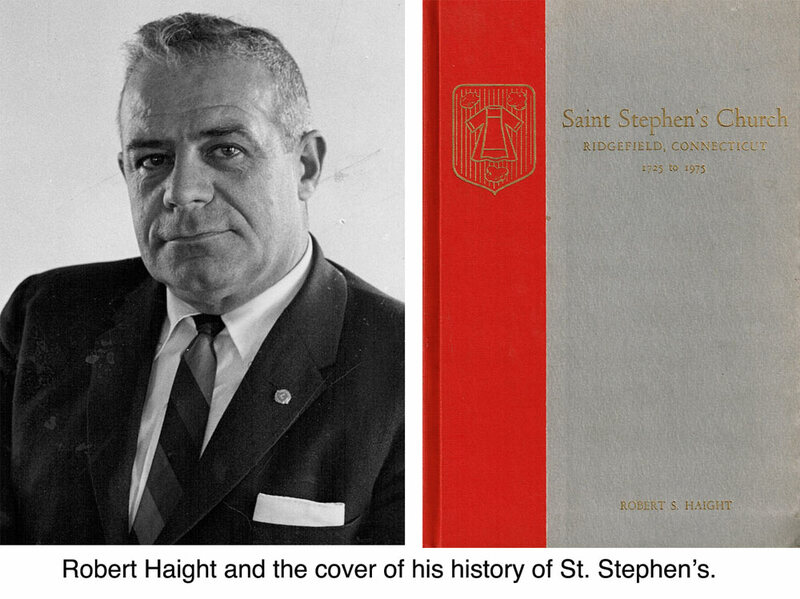 In 1967, Haight, a Republican, was elected to the Board of Education and two years later, was selected its chairman. It was during a period when the town was in the throes of rapid growth, and building new schools occupied much of the board’s time. In 1968, besides serving on the school board, he was named chairman of the town’s Elementary Schools Building Committee, which oversaw the construction of Barlow Mountain School. He resigned from the school board in 1970, both because of business commitments and disagreements with fellow board members over the future direction of the school system. Haight belonged to the Ridgefield Lions Club, and was elected its president in 1965. He had also served on the Flood and Erosion Control Board, the Republican Town Committee, and as a director of the Community Center. Active in boy scouting, he served as a director of the Mauwehu Council of the Boy Scouts of America. At St. Stephen’s, he had been a junior warden, a vestryman, and a chairman of the Nutmeg Festival, was active in the Men's Club and a delegate to various conventions. In 1972, he and his wife, Georgina, sold their home here and bought a vintage house in Walpole, N.H. They continued to live in Ridgefield, at Casagmo, until his retirement in 1976, when they left town for New Hampshire.